When Lucy tries to get Milton Berle to emcee a benefit show for the PTA, she discovers him swamped with other business demands and unable to find the peace and solitude necessary to finish writing a book before the publisher's deadline. Unbeknown to Ricky, who doesn't think his wife ought to be bothering a big star like Berle in the first place - Lucy offers Milton the daytime use of their Connecticut home, so that the man can work on his manuscript without interruption. Uncle Miltie accepts, with the understanding that he will appear at the school function if he finishes his writing on schedule. The arrangement works out fine, until nearsighted Fred tells Ricky that a mysterious stranger has been spending entire days at the Ricardo house while he's gone. Ricky storms home; Milton tries to escape in drag (as "Mildred"), and everyone ends up enemies. But Lucy still has a glimmer of hope for patching things up, so she tries to get in to see Berle at his New York high-rise office via the window and a construction worker's crane. Ricky arrives in the nick of time to save his wife and Berle from plunging to their deaths. Apologies abound and everybody stars in the PTA show, a Western spoof featuring the number "Them There Days" by composer Arthur Hamilton. Special Notes: This episode opens the third and final season. Due to mounting off-screen pressures, this season was cut to three episodes from the previous five. Desi Arnaz is credited as director of all three remaining episodes. His directing style is marked by more elaborate camera placement than his predecessors. Like most previous episodes, this one features a celebrity guest star and original music. This episode was filmed mostly without a studio audience, although one was brought in for a few of Milton Berle’s scenes, as he was used to playing in front of a live audience on his variety show. 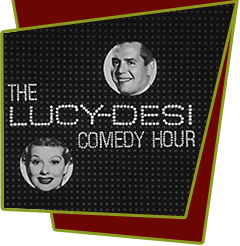 Before filming this episode, Lucy and Desi had just returned from a European cruise, a last-ditch attempt to save their failing marriage.